Will Google release the follow up to Android KitKat at Google I/O in June? The next version of Google Android is nearly upon us. But will it be the long awaited Android 5, or another minor update in the form of Android 4.5? Android 5 was expected to be released last year, but with the arrival of Android 4.4 KitKat, those hopes were dashed. But will we see the next version of Google's mobile operating software this year? And if we do, what can we expect? We've rounded up everything we know about the Android 4.5/5 below. The current version of Android – 4.4 KitKat – was officially unveiled last September and debuted on October 31st with the Google Nexus 5. So the big question now is, when will Google launch the next version of Android? If we had to predict when Google unveil the next version of Android, we'd put our money on Google I/O in June. Google's annual developers conference has been used to launch new version of Android in the past. This year's event takes place in San Francisco between June 25th and 26th. Going on previous trends, if Google does unveil the next version of Android at the event, it could be a month before it becomes available. Which leads us nicely on to the question of which phone will it debut on? One of the big questions is which phone will debut the next version of Android. Currently, the only rumours going around about Nexus hardware is about a the Google Nexus 8 and Nexus 10. We doubt Google would debut the next version of Android only on a tablet. That brings us to the big question of which model will be updated. Will it be the Nexus 5? We simply don't know. What we do know is that is likely to be made by HTC, so expect a smartphone based on the HTC One (M8). As for when it will appear on other smartphones, Google has made a point of telling smartphone makers to speed up deployment to their existing handsets. Android 4.4 KitKat has seen one of the slowest adoptions of a new version of Android – despite to pushes from companies like HTC to get it out within 90 days of its release. Even Android JellyBean was ahead of the curve than were KitKat is today. The latest figures from Chitika suggest that only 10 per cent of Android smartphones are running Android 4.4 KitKat. In other words, you'll probably have to buy a new phone to get your hands on it anytime soon, despite Google's protestations to smartphone makers. Reports have been flying around for a while now that one of the biggest additions to the next version of Android will be Google Babble. Android Geeks reported last year that the service would debut on Android 5.0. When Android 4.4 KitKat was announced, there was no sign of Babble suggesting that Google may have held it back. Babble is the codename for Google's cross-platform service that will bring together all of its chat services, including Talk, Hangout, Voice, Messenger, Chat for Google Drive and Chat on Google+. Last year also saw a couple of image leaks that suggested that Babble was in testing. However, 12 months later, there has been no sign of the service. So could we see it arrive with the next version of Android? We'd say so. Cross platform messaging is big business at the moment. Facebook's £11 billion acquisition shows how important it is for advertising giants and Google is the biggest of the bunch. Other features are likely to include more fitness apps and ways for developers to tie in devices. Chances are the next version of Android will launch around the same time as Google Glass becomes available to the public and Android Wear devices hit the shelves. We'd say this one's almost a certainty. In the middle of April, a screenshot leaked purporting to be of the next version of Android. 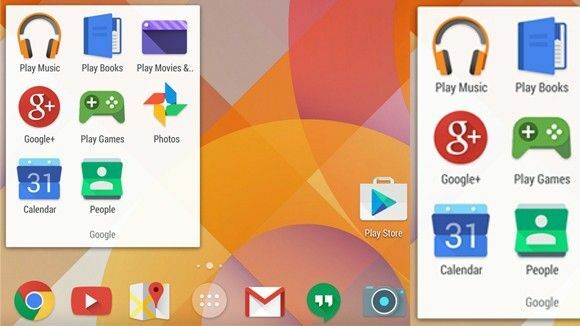 It shows a clear overhaul of the look of Android – including new icon designs. According to the leak, the design is being referred to as “Moonshine” within Google itself. But is it genuine? We'll have to wait to find out.